I feel bad for brown rice. With all the grain options in the bulk bins and now main-stream purchases, brown rice gets neglected even trash-talked a bit. But you know what? I still love brown rice, like a lot. There’s something perfect about it’s nutty flavor that is not too overpowering (because let’s be honest, there are a few grains out there that have quite a flavor). This soup is simple. I’ve been hoarding my summer canning like a mad woman. I’ve got one jar of salsa, a jar of pickles, and a few random tomato products. Next summer I’ll be canning a lot more tomatoes- I loved having the stewed tomatoes, salsa, and tomato sauce. The sauce made for a perfect winter’s soup. This soup is simple to throw together and makes for a hearty lunch or dinner. 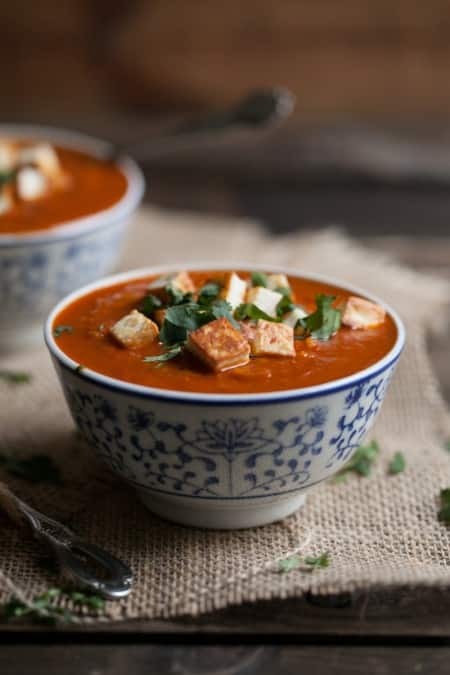 The paneer doesn’t add too much except that it’s fried cheese- I feel like that in itself is good enough reason to include it with this soup. Of course, I think coconut milk would make a great addition swirled in at the end as well. I used a Japanese Curry Powder that I picked up at a local spice shop. This was my first time using this specific curry powder and I really love the flavor. It’s a good curry that’s not too spicy and has a bit of sweetness to it. I found this recipe with the addition of the star anise and fenugreek. I’ve been wanting to start making my own blends and I think this one will be a good place to start! 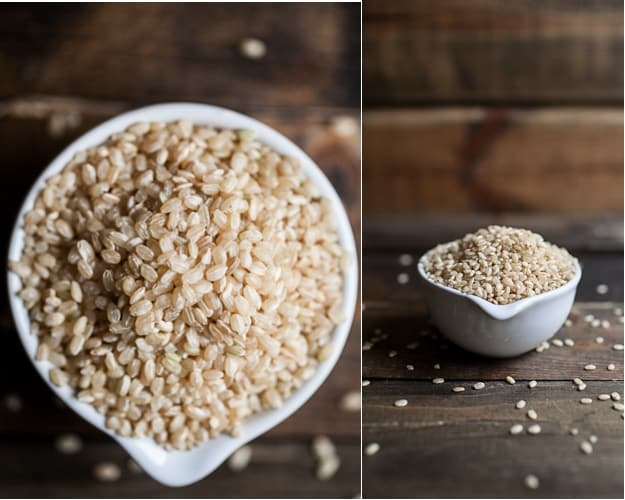 Oh, and if you decide you want a few more recipes for all that brown rice you just bought because of this post, check out my recipes and a few recipes from around the web for brown rice! Heat olive oil in a medium sauce pan over medium heat. Add onion and cook for 5-6 minutes. Stir in curry powder, then brown rice. Pour in tomato sauce and 1 cup of vegetable broth. Bring to a boil, reduce to a simmer, and let cook until rice is tender; 45-60 minutes. If soup thickens too much, add extra broth. Towards the end of cooking the soup, heat 1 tablespoon olive oil and fry paneer, shaking pan occasionally. 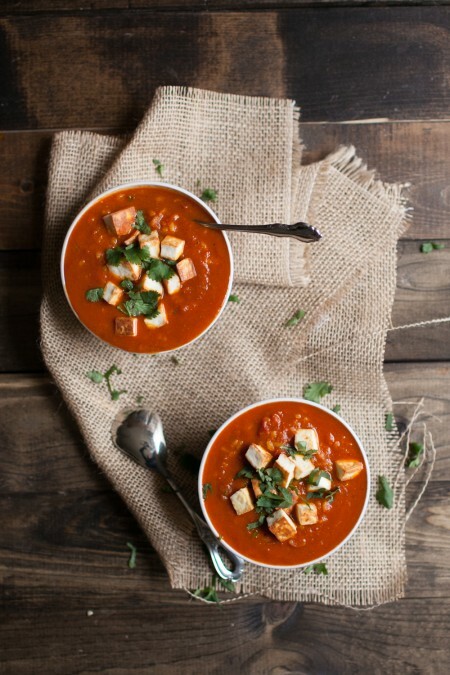 Serve soup with a few cubes of cheese and a sprinkle of cilantro. Gorgeous photos, woman! 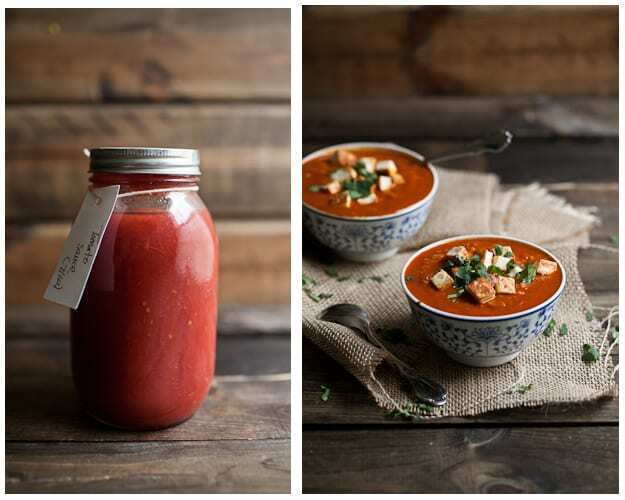 I could go for some tomato soup right about now. We just bought a 12 pound bag! I’m not quite sure how we’ll eat it all, but I think it freezes well? Erin, this looks delicious and I’m excited to see more from you two ladies on uses for brown rice! I don’t eat rice a lot but whenever I do, I try to pick the brown one! I love the addition of fried cheese in it! Fried paneer seriously makes me want to swear it’s so good. This sounds awesome! I love your website!!! It has been the best thing ever since I discovered it a few months ago. I have made so many of your recipes and they all come out delicious! I love that your ingredient list is minimal, easy to find, and the recipes don’t take too long to make. Thank you! 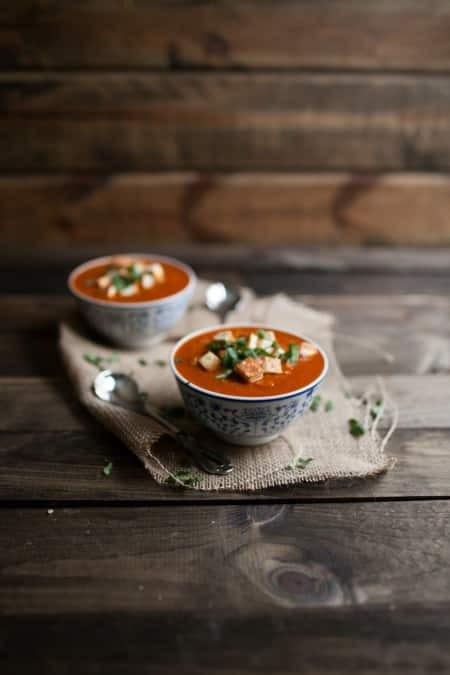 This soup looks absolutely incredible! My family is a massive fan of anything curried – especially with paneer. This looks like an amazing meal in a bowl with the added rice, with or without naan! Yummy! 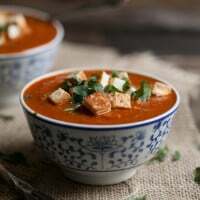 I think I could eat some form of curry every day and I think next time, I’m making naan to go with this soup- that sounds delicious! Love the pictures! So rustic and the mood is just so right.. I have been a brown rice eater myself for a long while, right now not so much..
Agree on the nuttiness part of it completely! I love brown rice too – you’re right, it seems to have become very unfashionable these days. This is a lovely recipe that I can imagine making time and time again! This looks fantastic! How many servings does it make? This is great. I never see soup recipes with short-grain brown rice (that isn’t precooked), so this was great. The texture reminded me a little of jambalaya! I also made my own paneer since it’s not available where I live in Japan. I made this for dinner tonight and I loved the flavor! I am a college student, so obviously making my own tomato sauce was out of the question (not enough time! ), but it was good with a carton of tomato sauce nonetheless. My only issue with the soup was that the brown rice wasn’t done after 45 minutes. I don’t think that my stove was hot enough, though. Make sure to use more heat than you normally would since you aren’t covering the soup. For me, it made three decent-sized servings. I ended up using two cups of vegetable broth, and I will probably add a bit more when I reheat this soup over the next couple of days. I used a sweet onion because that was all that wasn’t moldy at my local supermarket, but I think a standard yellow would be best. If you use sweet, be sure to add a little salt to the onions to give them some flavor, as they’re a bit too mild for 2 tbsps of (S&B) curry. I did change one thing about the recipe to make it vegan: I served it with seared tofu instead of paneer. This has the same pleasantly white appearance and mild flavor associated with paneer from what I can tell, and it’s nice in that you can use 4 oz per person for a complete protein. For a single serving, simply slice the tofu into 1/2 oz cubes (you should get 8 ~1/2 inch cubes) when you start the soup. Let it dry, wrapped in paper towels, until the soup is almost done. Heat 1/2 tsp of olive oil in a skillet over medium high heat and fry the tofu for 2 minutes on each side, salting it as you go. This soup is easy to make and clean after! I really appreciate this website’s multitude of tasty and fast, natural recipes! Thank you so much!! I did, but it was a new variety for me. Normally, I use brown mochi rice (AKA sweet glutinous rice) which has a much softer, chewier texture. My store was out, so I settled for the best looking short grain, but it will take some getting used to. I probably cooked it right but didn’t anticipate what “right” feels like. Haha! If you haven’t tried mochi rice, you really should! It’s quite a treat. It isn’t actually sweet (it’s named that for its common use in asian desserts) and it’s gluten free (the glutinous is a reference to its pleasantly chewy texture, not protein composition). But it’s sticky, shiny, nutty, and has such an incredible texture that it quickly became my favorite grain. 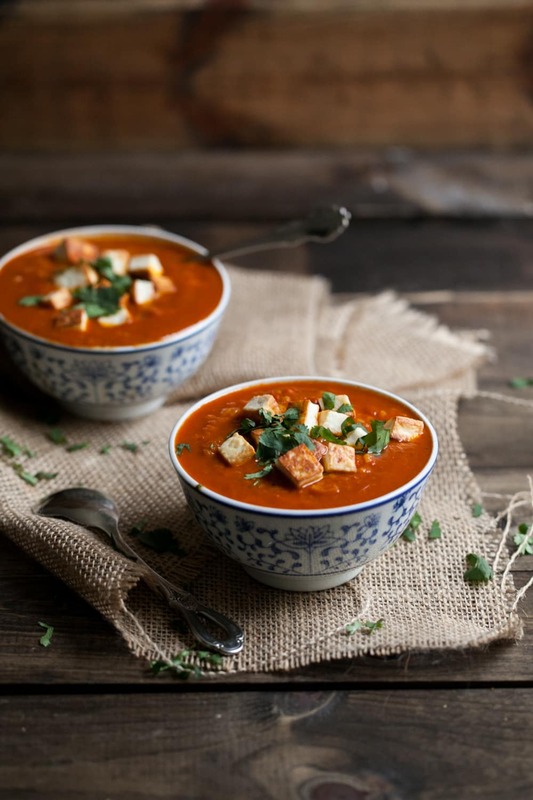 Wonderful change to our traditional tomato soup. No paneer, so we are having 101 cookbooks ‘little bread recipe’ on the side. I also had to increase the cook time in order for the rice to soften enough, I used short grain as directed.